Cell was a town-wide installation / performance mini festival in Ruthin, Denbighshire, in August 2010, as a side-project of Helfa Gelf, the north Wales Open Studios project. I created four new site-specific pieces. 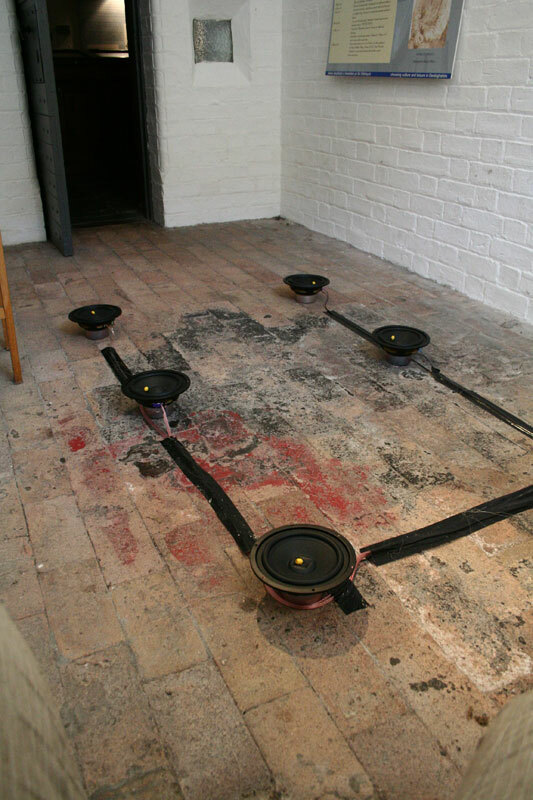 60Hz sinewaves are fed continuously through 6 upturned speaker cones on the floor of Cell #9 in Ruthin Gaol. A dismembered Lego head is placed into each cone; the vibration of the cone causes the heads to move around indefinitely in a chaotic, unpredictable way. Their simple, unceasing smiles are in stark contrast to the purgatory they must endure. When people are in prison, they’re trapped in their little cells and they can move around a bit but they can’t escape. They’re confined within the walls, and controlled by the prison guards. But they still have some freedoms and choices – freedom to think and decide what to talk about and what to read and what to do within the cell or within the prison work system. And even though it’s possible to predict some things about their lives (like how long they’re there for, what times they eat dinner etc), other things are impossible to know in advance. I wanted to do a piece that had similar features – a conflict between freedom and confinement and a conflict between predictability and unpredictability. Now – I don’t know whether you’d seen your dad’s amp when he’s playing guitar, but when you play really low notes through a loudspeaker, in order to make the sound, the loudspeaker has to move backwards and forwards through the air so that you can actually see it moving, and if you touch the paper in the middle you’ll really feel it wobbling. High pitched sounds don’t do this, because the movement is too fast to see and too small to be felt. But low pitched sounds cause some serious wobble. This is where the fun starts. 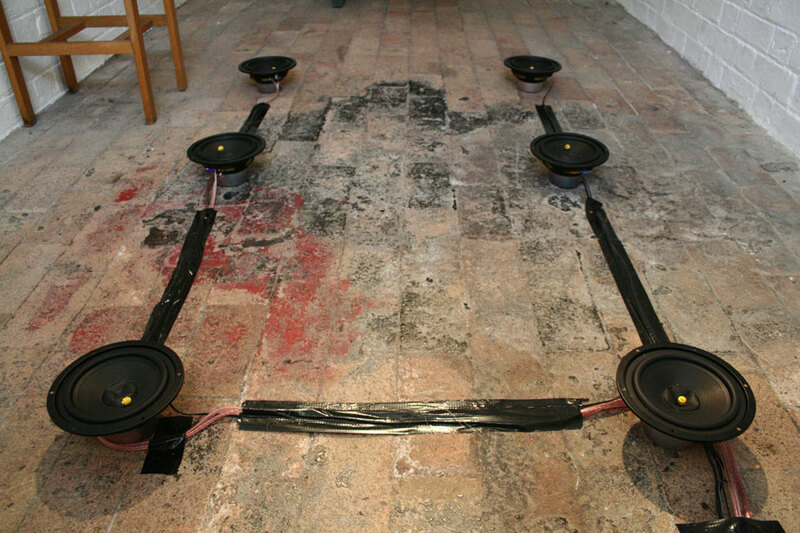 Normally, speakers face sideways so that you can hear them properly when you’re standing in a room, but if you lay them down on the floor so that they’re pointing straight up, you basically have a mini trampoline. 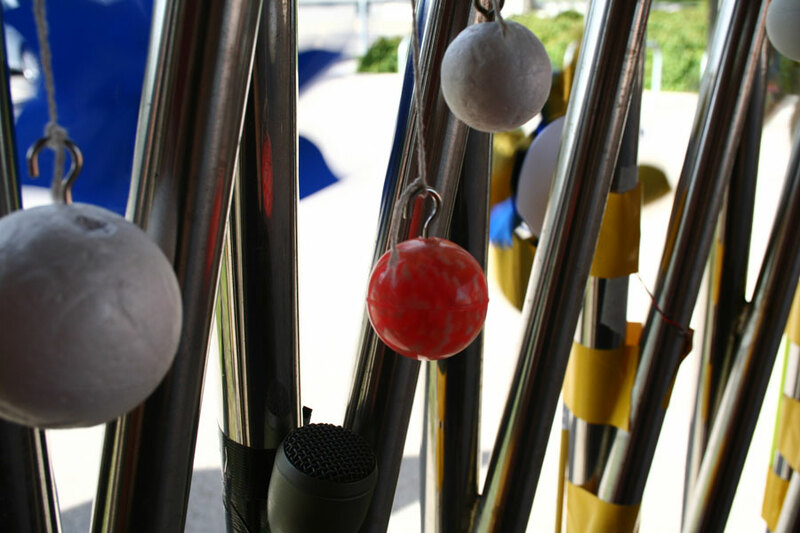 If you play a really low pitched note through a speaker on its back, and put a small object like a ping pong ball or a pea into the hollow, the movement of the paper cone will cause the thing in the cone to bobble around forever (or until the sound stops). 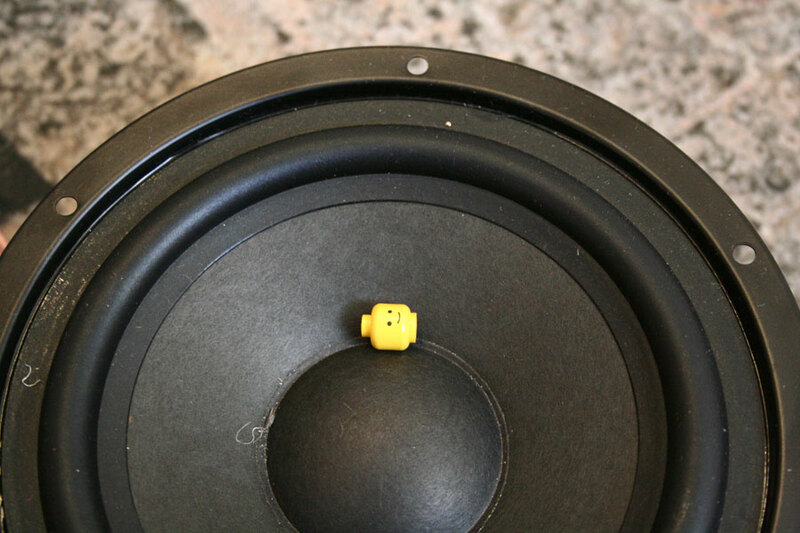 If you have the volume too loud, and the speaker is moving too much, the thing will jump straight out, so you set the volume so that the thing jumps around but not too much. The thing is now trapped! It moves around inside the loudspeaker, but it can’t ever escape – it’s a prisoner, free to bobble around wherever it likes inside the cone, but it can’t get out. 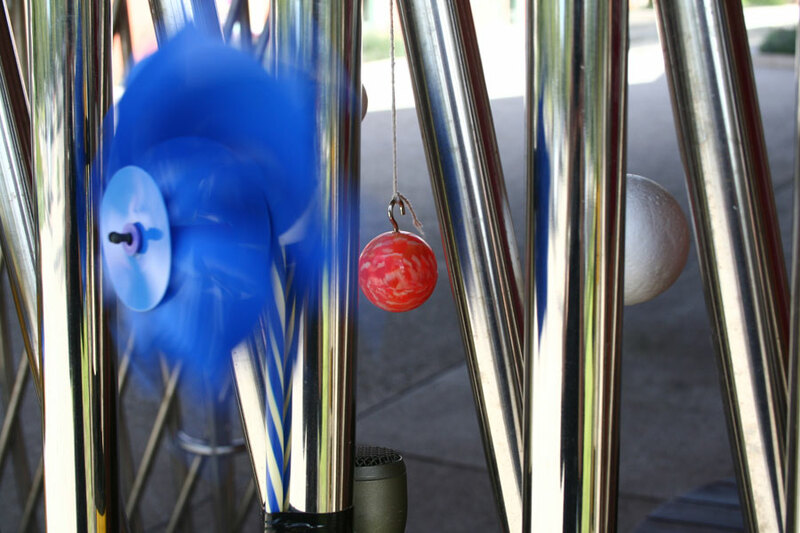 And even though the movement of the cone is really really simple (the paper is just moving up and down), it’s not physically possible to predict exactly where the thing will bounce to next. So at any given moment, even if you had a very powerful computer, you wouldn’t be able to tell where the thing will go next, or where it’s just come from. If you watch the bobbling, it seems totally random, and there are some quite difficult and complicated maths, physics and philosophies going on (quantum mechanics, nomological determinism etc). 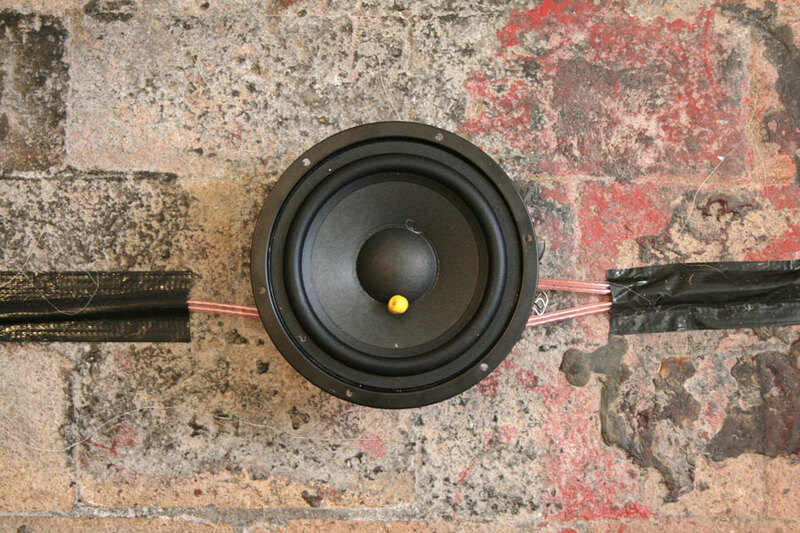 So the small objects in the speaker are prisoners, and the speaker is the prison. 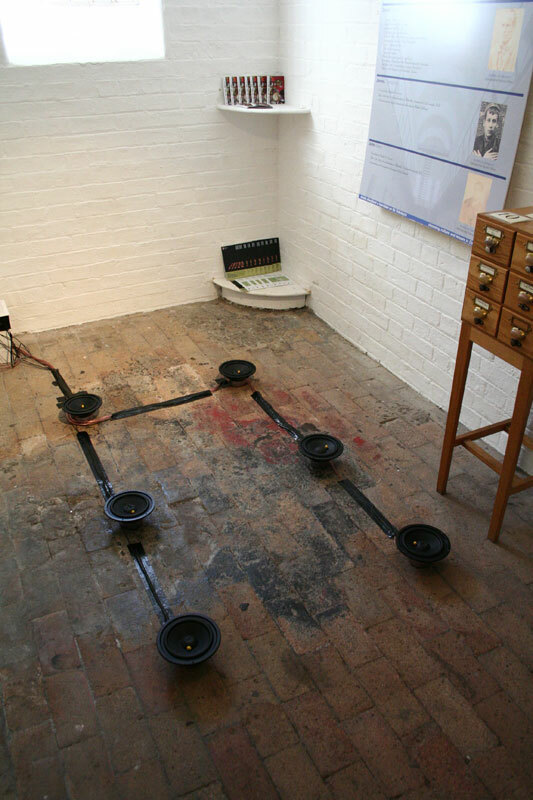 What I wanted to do was put 6 loudspeakers in a small prison cell, run a really low pitched sound through them all, put small objects into the loudspeakers and then leave them to run all day long. As well as being able to watch the things all bobble around, they’re all making a noise when they bobble – so with six of these going on at the same time you get this chaotic sound all around you, lots of very busy bobbling noises. 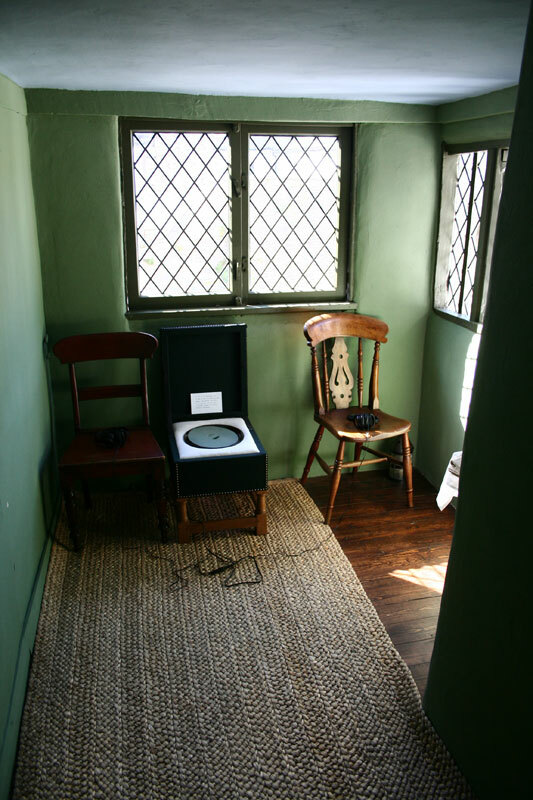 Plus, if you get close to the speakers you can hear the low drone in the background (human ears don’t pick up very low frequencies very well). The only question I had left to answer was what to put into the loudspeakers as bobblers. I wanted a strong concept, so didn’t want to just put anything in there without there being a reason. So although things like uncooked rice, peppercorns, ping pong balls etc would have been okay, I wanted something with more meaning. And then suddenly I thought about Owen and I had the idea! Lego heads! Lego heads would be perfect because they’re the right size and weight to bobble, and it’s easier to see them as prisoners, which is what the piece was about. What makes them even more perfect is that the Lego heads I have are the original old ones with very simple smiling faces. And so there’s a dark and slightly twisted humour about having these tortured prisoners looking so happy as they bounce around – a happiness in total contrast to their situation. The end result – something fun to look at and listen to but that can also be thought of in a deeper and more philosophical way. 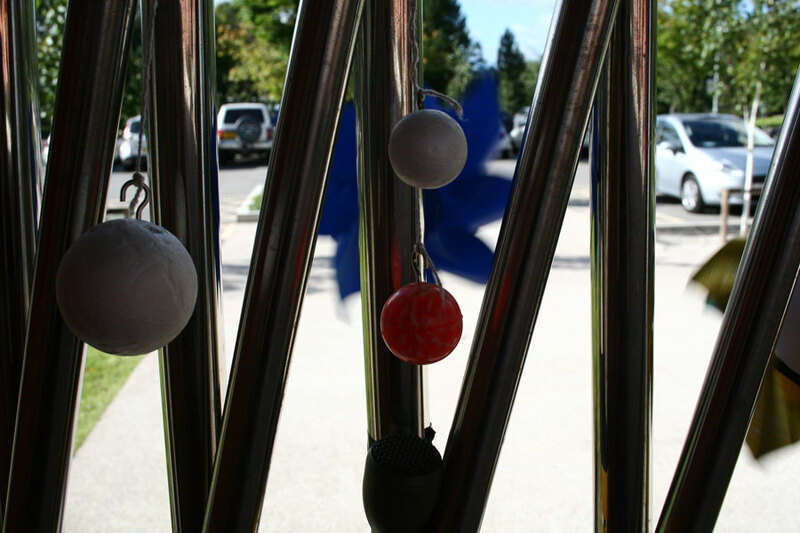 An attempt to turn the huge Craft Centre entrance gate into a wind-powered musical instrument. 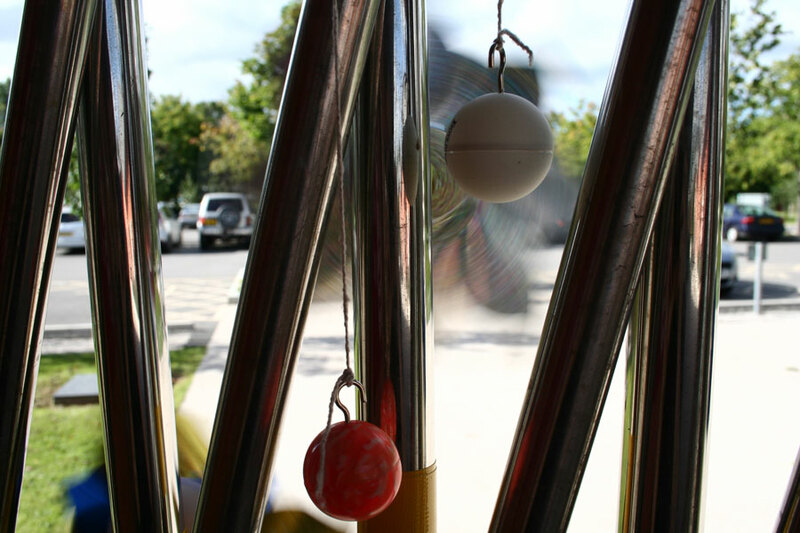 5 toy windmills are taped to the metal railings along with a series of ‘knockers’ – ping pong, bouncy rubber and polystyrene balls attached to strings. 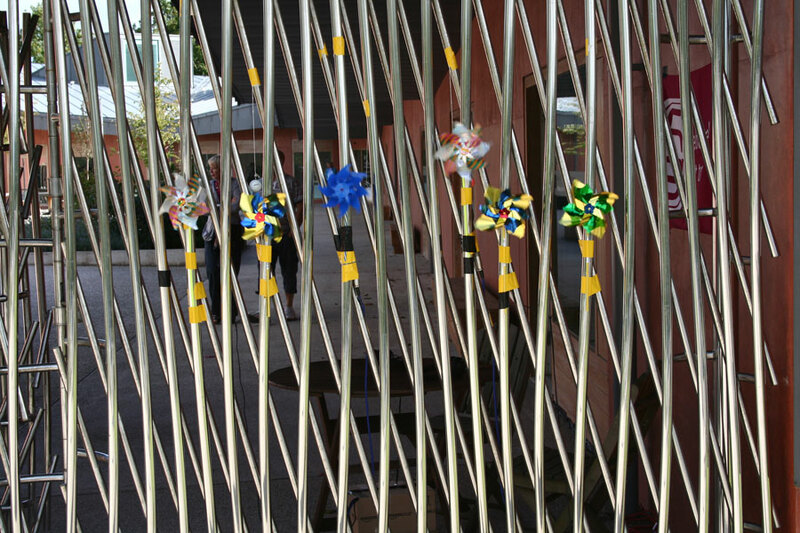 The knockers are positioned such that gusts of wind cause them to be blown away from the gate, returning to strike the gate’s vertical supports when the gust fades. 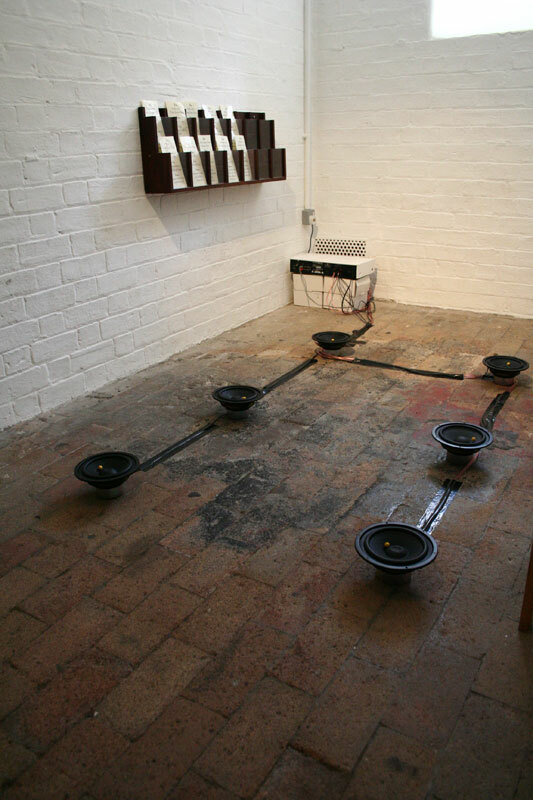 4 piezoelectric contact mics and 2 unidirectional field mics are also attached to the railings, and these are fed to a 16 track mixing desk and out to 2 sets of headphones, left on a nearby table and chairs. 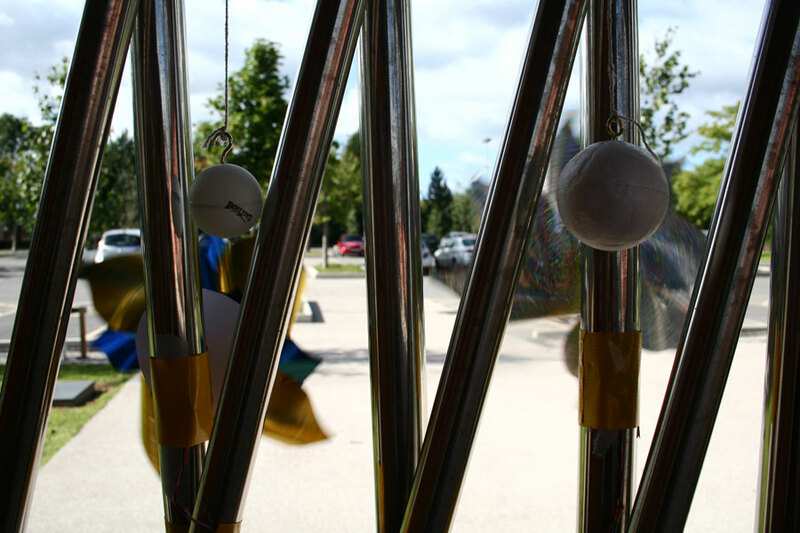 The windmills cause the gate to resonate, the knockers provide arrhythmic percussive events of varying timbres, and the mics pick up all these internal and external hums, drones, bongs and squeaks, creating a non-repeating and self-playing amplified instrument. Did I get a recording of this happening? No. Why not? Because I’m an idiot. 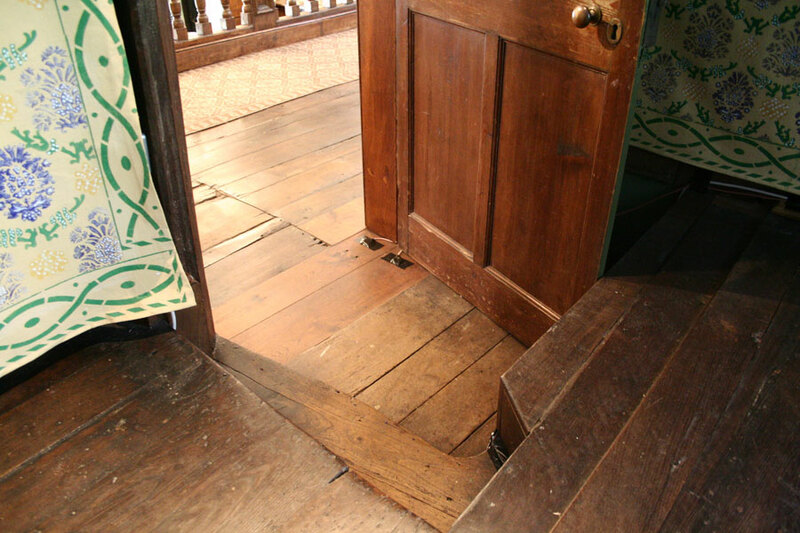 Two sensitive piezoelectric contact mics are attached to two creaky floorboards in a 15th century house. 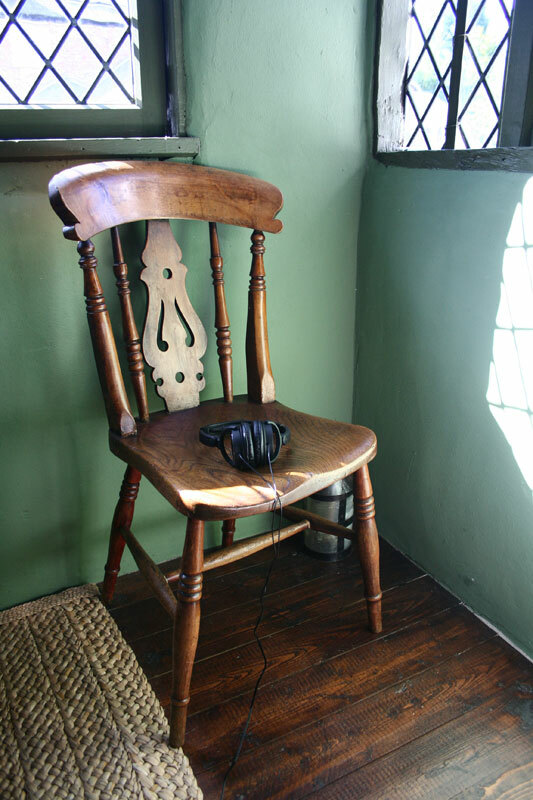 The cables are then fed off into a small Jacobean en-suite and end in two sets of headphones positioned on old wooden chairs either side of the ‘stool of ease’ (the en-suite’s marvellously named commode). 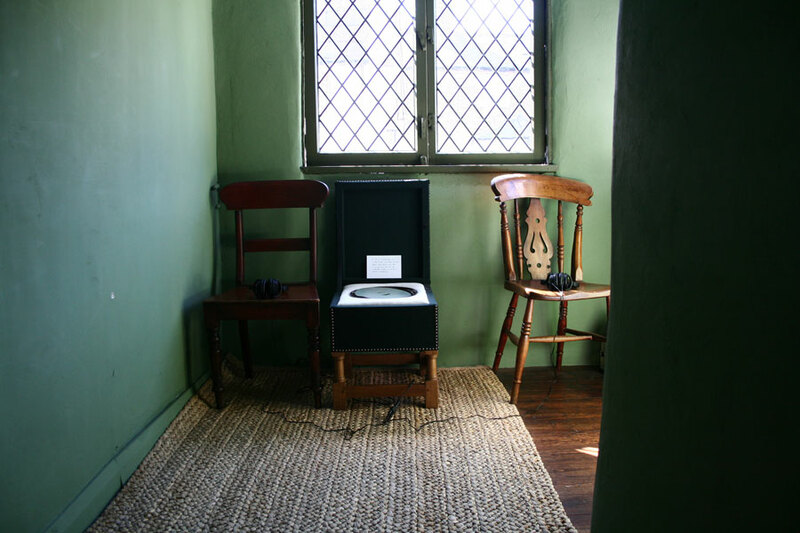 Audience members are invited to hide in the en-suite and listen to the resulting amplified other-worldly creaks, squeaks, cracks and hisses coming from the house. Because they can’t see the location of the microphones, they don’t know the source of the sounds they’re hearing, whether they’re live, caused by other real people wandering around the house, spirits, or simply the house itself. A 12 minute video loop shown in a small dark cupboard. An underground train speeds through an anonymous series of tunnels but never reaches its destination. The title is a play on the work of Pierre Teilhard de Chardin, and has nothing whatsoever to do with either Flannery O’Connor or The Hafler Trio.